Introduced in 1915, the Georg Jensen Acorn pattern has become a sterling silver classic! This chic flatware is an excellent example of applied art from the European Arts and Crafts movement of the early 1900s, which looked to the organic shapes of nature for inspiration. ACORN by Georg Jensen, Issue Date: 1915. 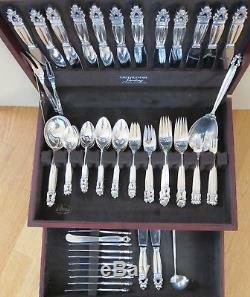 96 Sterling silver pieces with some serving/special pieces. 14 Dinner Size Knives, 9 inches. 15 Dinner Size Forks, 7 1/4 inches. 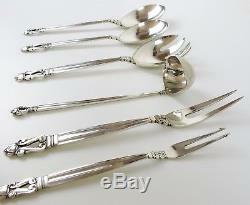 13 Salad/Dessert Forks, 6 1/2 inches. 12 Teaspoons, 6 1/8 inches. 12 Tablespoons, 6 3/4 inches. 10 Butter Spreaders, 5 7/8 inches. 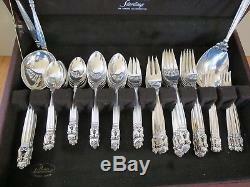 12 Oyster Forks (3 Prongs), 5 5/8 inches. 1 Casserole Serving Spoon, 9 inches. 3 Serving Spoons, 8 inches. 1 Serving Fork, 8 inches. 1 Gravy Ladle, 6 3/4 inches. 1 2-Tine Cold Cut Serving Fork, 7 7/8 inches. 1 Short Handle Pickle/Olive Fork, 6 1/2 inches. 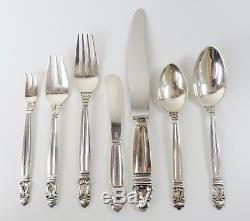 This set of sterling flatware is in excellent condition, not monogrammed. 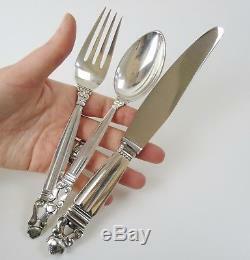 All pieces are marked, "Georg Jensen, Sterling, Denmark". 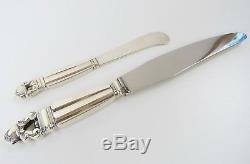 The Dinner knives and have sterling handles with stainless steel ends. 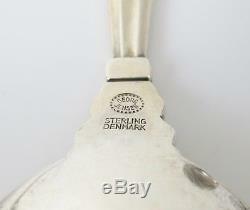 The handles are marked, "sterling" and the ends are marked, "Georg Jensen, Denmark, Stainless Steel, Raadvad". This set ncludes a large vintage (not Georg Jensen) storage chest. 100 % of the items I sell are pre-owned, vintage, or antique. Every item I sell will have some signs of wear. The combination of photos and descriptions are my best effort to communicate the beauty, condition, and any defects. Your personal expertise regarding an item may well be greater than mine so feel free to ask questions regarding elements not mentioned in my description. Does your government charge duty? 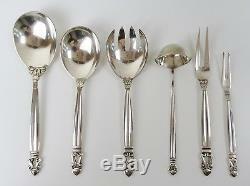 The item "12 Place setting Georg Jensen Acorn Denmark sterling silver flatware set" is in sale since Sunday, August 19, 2018. This item is in the category "Antiques\Silver\Sterling Silver (. The seller is "justifiable_expense" and is located in Eugene, Oregon. This item can be shipped to North, South, or Latin America, all countries in Europe.